There is no more recurrent question posed in real estate analysis than, “Where are we in the cycle?” The mood amongst economic forecasters can best be described as “benign.” While there is a general consensus that the present expansion is getting long in the tooth, at 96 months and counting, most (correctly) assert that business cycles do not die of old age. For the record, this is already the third longest upcycle since 1850. But it is also the weakest since World War II. The upcycle of the 1990s reached 120 months, but averaged 3.6% annual real GDP growth over that decade. The recovery since the Global Financial Crisis has averaged a bit under 2.1% annually. Given slower labor force growth (even absent a lower participation rate) and decelerating productivity improvements, the baseline growth in the years ahead appears to be in the 1.7% - 1.9% range. Expectations of a return to the growth of the 1990s simply cannot be justified in the numbers. Some comfort is being taken by the absence of typical signs of economic overheating that often precede recessions. Inflation remains quiescent, with low energy prices driving prices at the gas pump down to near $2.00 per gallon during the peak summer travel season. The Federal Reserve has been gradually raising its benchmark rates, but is being careful to avoid squeezing economic growth in the process. The “Trump Bump” in stock prices has shown staying power on Wall Street, but as the year advances it becomes clearer that the agenda of tax reform, infrastructure spending, Dodd-Frank rollback, and entitlement reduction will not be accomplished in 2017. Hence, there is probably greater fragility in the economy than the consensus acknowledges and risk is present from either domestic disappointments or international disruption. Jobs. There seems to be a healthy fluidity in the labor markets, with the Bureau of Labor Statistics JOLTS (Job Openings and Labor Turnover Survey) showing job hires (5.5 million) well matched to job openings (5.7 million), and the number of voluntary separations (“quits”) at 3.2 million running roughly twice as high as layoffs and discharges (1.7 million). The unemployment rate was 4.4% as of June, its fourth consecutive month at 4.5% or less. 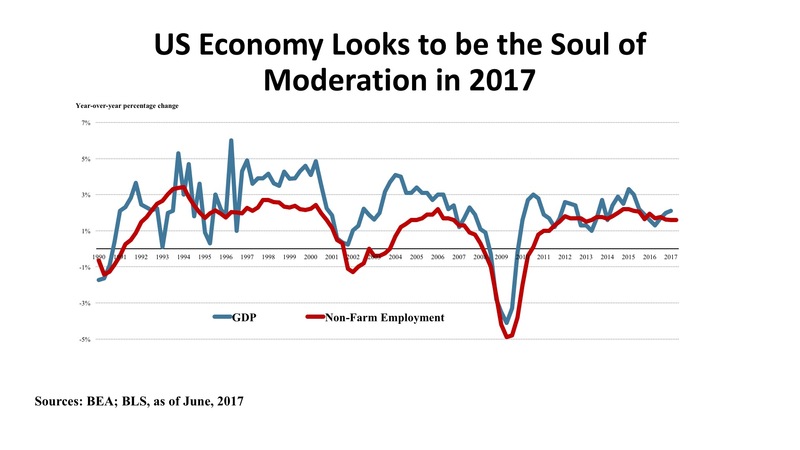 Overall job growth averaged 180,000 per month during the first half of the year, and the Blue Chip Economists forecast slippage to a 166,000 monthly average for the balance of 2017. Office sector demand has been bolstered with business and professional service employment rising by 625,000 year-over-year while financial service gained 169,000 jobs. Transportation and warehousing employment is up by 97,000, largely due to e-commerce (although this did limit retail job growth to just 20,000). Manufacturing eked out a 49,000 job gain, but construction activity posted a substantial job increase of 206,000 over the twelve months ending June 2017. Policy. As of this writing, six months of efforts on healthcare reform (“repeal and replace”) have gone nowhere, and the legislative and executive focus on this pivotal issue created a logjam affecting all other elements of the domestic policy agenda. Most of the key tax cut items contemplated in the brief outline released by the White House in April were held together by the linchpin of purported savings in the failed Healthcare package considered by the House and the Senate. Without those savings, the tax plan either significantly increases the Federal operating deficit or requires draconian cuts to discretionary domestic spending. Either choice faces difficulty on Capitol Hill. The next immediate policy hurdle is the requirement to pass a budget and approve a debt ceiling increase in September, or else risk a government shutdown. “Who knew it would be so complicated?” In all probability, Washington will muddle through, as there is little upside to a pitched battle on policy at this point. Still, the high hopes many had for substantive change are facing a disappointing reality check and 2017 appears to be less the beginning of an era of disruptive change and more a story of “the same old same old” to those outside the Beltway. Outlook. There is a very narrow range in forecasts for key variables in the economy: GDP growth; unemployment; personal consumption expenditures; trade balance; housing starts; vehicle sales; all are basically projected to continue recent trend lines. The difficulty is that while expectations are linear, risks are non-linear. Asset pricing in real estate as well as in the stock market is high, and investment volume is being driven more by the pool of capital than by earnings fundamentals. While some are extolling a “Goldilocks” condition in the economy, potential surprises are asymmetrical at this point – more likely on the downside than the upside – with risk managers now speaking more frequently about a possible “Black Swan” as the trigger for cyclical change. Almost all of the states in the Western region show good to excellent economic indicators at the present time. Job growth in California (242,600) in the past year was surpassed only by Texas amongst the fifty states. Utah’s rate of job growth (3.3%) was about twice the national rate (1.6%) Other states with employment growth above 2% were Nevada (2.7%), Idaho, Oregon, and Washington (each at 2.4%). In addition, Colorado, Hawaii, Idaho, and Utah boast unemployment rates under 3.5%. In the region, only New Mexico and Alaska show signs of economic difficulty. Income data indicates similar strength. Six states are seeing personal income gains above the national average; those states are Idaho, Montana, Nevada, Utah, Wyoming, and Washington. California, Arizona, and New Mexico show rates of income growth very close to the national norm. So it would appear that the quality of jobs, as well as the quantity, exhibit strong economic vitality. Income inequality, however, is an issue for the region and may continue to be so in the years ahead. Looking forward, opportunities for economic growth may depend upon what sector economists identify as “middle skill jobs.” Middle skill jobs require a high school education but do not demand a college degree. These jobs are prevalent in construction, building systems, transportation, and even in technician jobs in healthcare. Such jobs represent about 54% of U.S. occupations (high skill jobs are about 30%, and low skill jobs are 16% of the national total). Economic mobility in the future may come largely from workers’ ability to migrate from lower skilled job, which pay less and are more vulnerable to automation or outsourcing, to middle-skilled work. 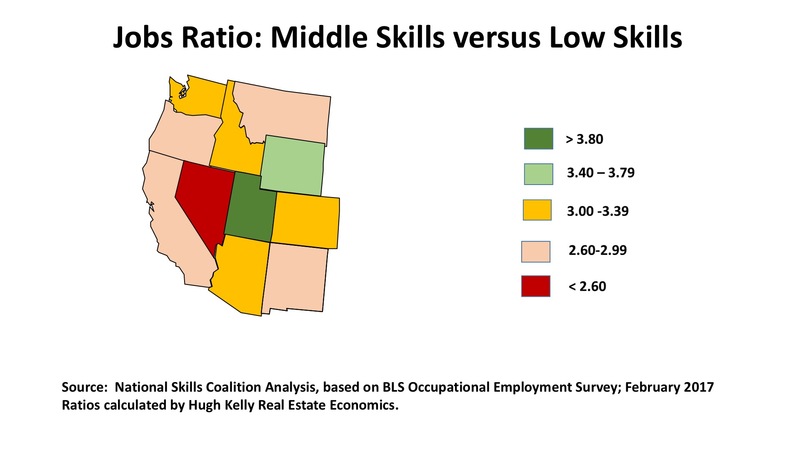 But states including California, Colorado, New Mexico, Oregon, Utah, and Washington have disproportionately large numbers of high-skill jobs, and see middle skill jobs below the national average (as suggested by the accompanying map). Thus it could be more difficult in a tight labor market for lower-skilled workers to make significant advances over the course of their careers, and to find themselves at greater risk of job loss due to automation or outsourcing over time. Now that we are solidly six years into a favorable real estate cycle, the velocity of investment transactions is easing. Nationally, office deal volume is off 5% from a year ago while retail is down 20%. Industrials, however, are holding their own. There seems to be an abundance of capital seeking a home in commercial property, but high prices are constraining buyer interest and sellers are asking what their re-investment strategy might be if they chose to take profits at the present moment. As rents have returned to pre-crash highs and vacancy has tightened, investors are seeking higher cash returns now and relying on speculative income and appreciation improvements less. 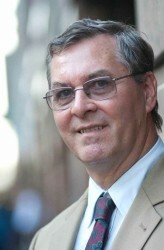 Nevertheless, pricing has remained strong even if deal flow has ebbed. The evidence suggests great discipline in the market. The question is: can it last? Office. Remarkably, five Western office markets surpassed the billion-dollar threshold in office investment year-to-date: Los Angeles ($4.1 billion); San Francisco ($2.7 billion); San Jose ($1.6 billion); Seattle ($1.1 billion); and, Phoenix ($1.0 billion). With the exception of San Francisco, transactions were predominantly in suburban areas, rather than the central business districts. Cap rates below 5% on average were typical in those markets, as well as in Portland, San Diego, and Sacramento, a clear signal of investors’ favorable assessment of the future for such assets. All in all, the Western States registered $15.6 billion in office volume, 31% of the U.S. total for this sector thus far in 2017. As investors exhibit selectivity, the major Western markets are competing very effectively for capital. Industrial. Real Capital Analytics counted 752 industrial property transactions January to May 2017, with a total transaction volume of $7.1 billion. This represented 35% of the national industrial deal count and 32% of U.S. sales volume for the sector. This is persuasive evidence of how favorably buyers of commercial property are viewing this property and this geographic region. The division of capital between the R&D/flex segment and the more traditional warehouse/distribution market is far more balanced in the West than nationally. Outside the West, R&D/flex had about a 33% share of industrial investment. With such tech centers as Silicon Valley, San Diego, Orange County, and the East Bay, the R&D/flex share was 41% across the West. Cap rates for all segments of the Industrial property segments are significantly lower in the West than the national averages. Retail. For a region known for its vast freeway systems and suburban and even exurban lifestyle, investors are spreading their attention nicely between shopping centers and the stores located in both large and small downtowns across the Western States. 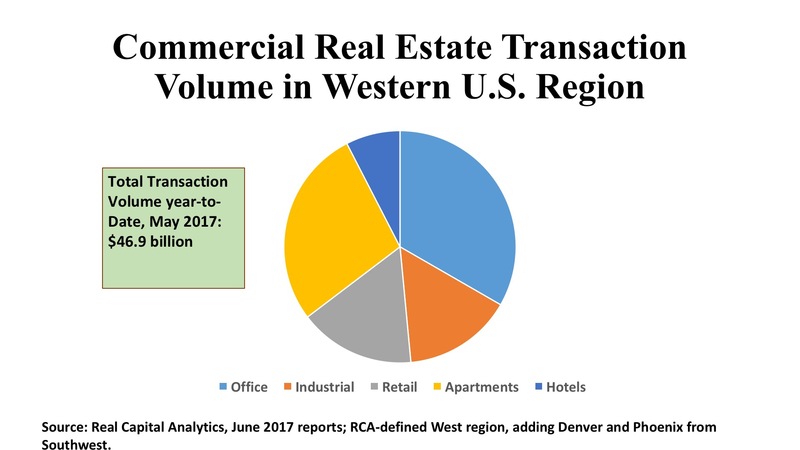 Even with retail investment slipping across the country, the West tallied $7.6 billion in retail property deals year-to-date, for a 29% share of all real estate capital flowing into the region. As befits its place as the largest Western market, Los Angeles had the highest investment volume with $1.3 billion, with about two-thirds in shopping centers and one-third in standalone stores. San Francisco was not far behind at $1.2 billion in total retail property investment, 35% of which was devoted to high-street establishments. The urban share was even higher in the Pacific Northwest. Seattle’s store segment represented 41% of the $515 million of retail acquisitions three, and Portland had an even higher 58% of its $257 million retail purchases classified in the “stores” segment.